Fahim, the honey, the love of my life, never quits. Never give up, never surrender! Because it&#39;s not enough for him to work for clients, he decided to write a book. This time, though, he decided to mix his love of science fiction and fantasy with his love for programming. So what does he do? 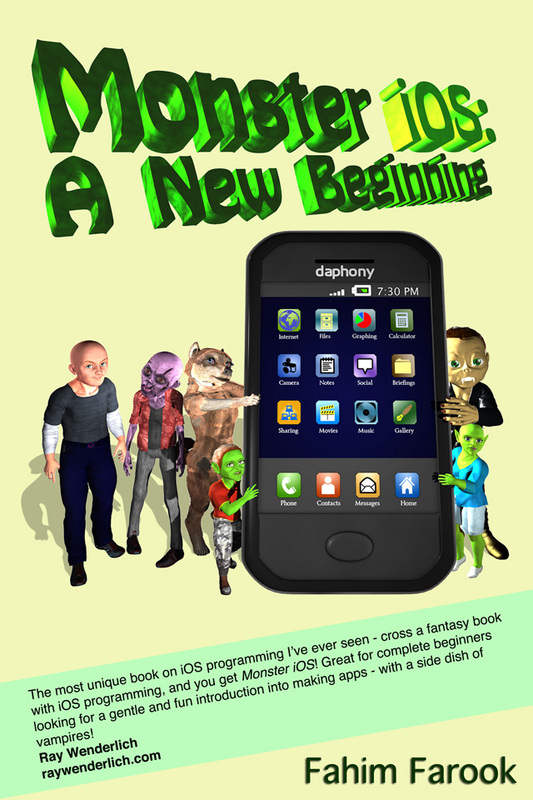 He writes <a href="http://monster.rooksoft.sg"><em>Monster iOS: A New Beginning</em></a>, an iOS 7 programming book. iOS 7 is Apple&#39;s next operating system for the iPhone and iPad. To teach absolute novices how to develop iOS 7 apps (applications), he throws in a werewolf (Wendy),&nbsp; a zombie (Zane, who&#39;s also my favourite), a vampire (Vincent), and two gnomes (Gina and Gino). He teaches iOS development through questions and answers and conversation between the monsters and Dave the Dev, who the monsters brought to their world solely because they wanted to learn iOS development. The book. It might sound a bit crazy, but you know what? It works. I&#39;ve read it, and, true, I&#39;m biased, but still. It works. It&#39;s fun, it&#39;s interesting, and it teaches absolute beginners with zero experience in programming all about how to develop an app for iOS 7.